This collection of drawings of birds consists of the work of two distinct schools of Indian natural history painters. Those with the landscapes were painted by Lucknow artists in about 1790, and those without such backgrounds by Calcutta artists in about 1800. The two sets were subsequently put together and numbered and inscribed in Persian by, presumably, an Indian collector. In the examples from Lucknow, the style of drawing is still derived from the late Mughal school of painting flourishing at Lucknow in the late 18th century, with its emphasis on the meticulous rendering of every line and feather in the bird's plumage. The landscape, with its flat ground fading to blue in the distance, bisected by a river, and with highly distinctive diminutive trees, is derived from that introduced into Lucknow painting in the 1760s, by the artist Mihr Chand who was very receptive to European ideas on the rendering of space and volume. Another western feature, not quite so well absorbed here, is the preoccupation shown with the casting of shadows. These exceptional paintings are rare as many must have been destroyed in the sack of the Lucknow palaces in 1857. A similar example was sold at Christie's London, 25 May 1995, lot 29, £7,475. (see p. for an illustration) The examples from Calcutta are further removed from Mughal influence, and show more of a concern with the rounded volumes of the bird's body, although the Mughal tradition is often continued in the rendering of the tail feathers. 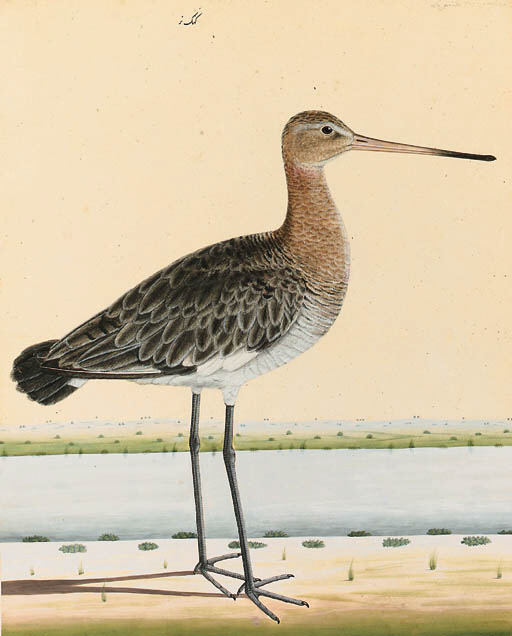 Although Mughal artists had worked for Lady Impey on the celebrated series of bird paintings executed for her in the 1770-80s, by the 1790s such artists had been taught the more scientific methods of natural history depiction introduced by such men as Dr William Roxburgh at the East India Company's botanical gardens at Sibpur, Calcutta. It was these artists who also painted the birds and animals assembled by the Marquess Wellesley for the aviary and menagerie at his country house at Barrackpur. Similar examples occur among the drawings of these specimens sent by Wellesley's assistants to the East India Company's library in the early years of the 19th century and in Wellesley's own collection. See M. Archer, Natural History Drawings in the India Office Library, London, 1962. We are grateful to Jerry Losty of the India Office Library for his help in preparing this catalogue entry.